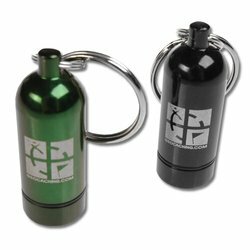 Geocache Micro-Cache Capsule Green [MCCAP_GREEN] - $6.99 : Trail Explorers Outpost, Keeping the Adventure Alive! Description: Don't make it easy! These micro cache containers are perfect for placing that elusive cache. A choice of colors will enable them to blend them in with just about every environment. Made out of anodized aluminum with two rubber 'o' rings that make it waterproof. These capsules measure 2" tall x .75" in diameter and include a split ring for attaching to your keys.